Python scripting in dirtyJOE can be used to modify CONSTANT_Utf8 objects from Constant Pool. One of the main use is decryption of CONSTANT_Utf8 objects in obfuscated .class files. 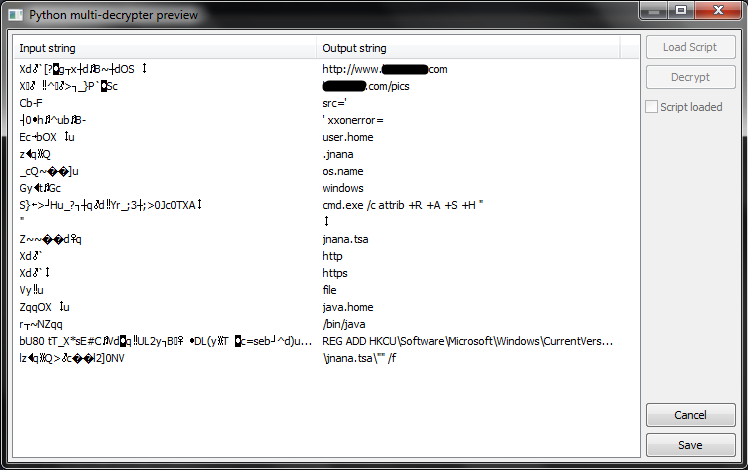 Decrypted objects are useful in forensic analysis, they can be also used to translate obfuscated java application. Function responsible for translating the Java Utf8 input buffer (tuple) to list of integer that represents each character. Function responsible for translating list of integers that represent each characters to the Java Utf8 buffer (list). Standard decrypter for strings encoded by Zelix KlassMaster obfuscator, it can be also used to re-encrypt strings (very useful for translation of obfuscated Java applications). Usage example can be found in \scripts\zkm_decrypt.py file. 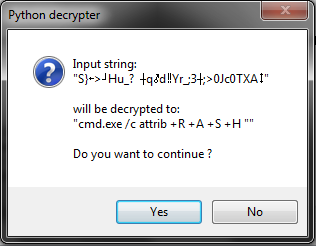 Standard decrypter for strings encoded by Allatori obfuscator, it can be also used to re-encrypt strings (very useful for translation of obfuscated Java applications). Usage example can be found in \scripts\allatori_decrypt.py file. I'll show how to use python scripting on sample obfuscated java malware called Boonana. Mentioned malware appeared in october 2010 and was obfuscated with Zelix KlassMaster 5.3.3E (according to entry in constant pool "ZKM5.3.3E"). 00000089 : ldc                 "Xd `[?gxdB~dOS"